1. If I do something caring for a friend, I have no doubt in my mind they would do it for me. 2. If they asked me, I did two shifts. I did sports, I did news, because I loved it. 3. Questions about my marriages and divorces always take me to the same place. I once asked Stephen Hawking, the smartest guy in the world, what he didn’t understand. He said, “Women.” If the smartest guy in the world couldn’t understand them, what do you expect from me? 4. It’s the best thing I do. There’s no bigger kick for me than helping someone get their heart back. 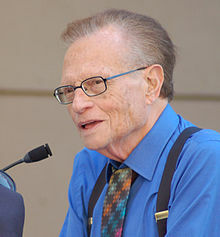 Excerpt from Wikipedia: Larry King (born November 19, 1933) is an American television and radio host whose work has been recognized with awards including two Peabodys and ten Cable ACE Awards. He began as a local Florida journalist and radio interviewer in the 1950s and 1960s and became prominent as an all-night national radio broadcaster starting in 1978. From 1985 to 2010, he hosted the nightly interview TV program Larry King Live on CNN. 1. There is nothing in your destiny, nothing in your future that you cannot accomplish. 2. I’ve made a lot of mistakes. I’ve bonded with some people who use you, and some people that take advantage of you. 3. You cannot talk to people successfully if they think you are not interested in what they have to say or you have no respect for them. 4. The first rule of my speaking is: listen! 5. Those who have succeeded at anything and don’t mention luck are kidding themselves. 6. If you look at the media now all of the hosts of these other shows are interviewing themselves. The guests are a prop for the hosts on these cable networks. The guests for me are always the paramount. 7. Getting your house in order and reducing the confusion gives you more control over your life. Personal organization some how releases or frees you to operate more effectively. 8. I remind myself every morning: Nothing I say this day will teach me anything. So if I’m going to learn, I must do it by listening. 9. I like to put a stake in people, because I know people helped me. 10. I worked on the United Parcel Service truck, I sold home delivery of milk. But always, in the back of my mind, I wanted to get into radio. 11. I’m having as much fun today as I did when I made $55 a week, because it is as much fun. 12. You can’t have happiness without having had unhappiness, because how else would you know what’s happy? 13. If you do something, expect consequences.